With Instagram available as a channel in Facebook’s Ad Manager, you have an additional path to reach your customers and new prospects. With the power of Sailthru’s Audience builder, you can use our integration with Facebook Custom Audiences to reach your known users on Instagram as easily as you can reach those on Facebook, and acquire more valuable customers on each platform with Lookalike Audience targeting. Before you begin, ensure that you have configured your Facebook Custom Audiences integration by confirming your permissions to the Facebook account as a business admin or ad account admin and entering your Facebook Ad Account ID on the Sailthru Integrations page. Using Sailthru’s Audience Builder, you can create a segment of users to sync with the Facebook platform and make available for Instagram advertising. In My Sailthru, from the Users menu, select Audience Builder. Select the criteria you want to match and save the list. Note: While you can create a Facebook Custom Audience from any list in Sailthru, we’ve seen considerable success for clients using the instructions for creating Smart Lists containing high-value user segments using Prediction Manager. 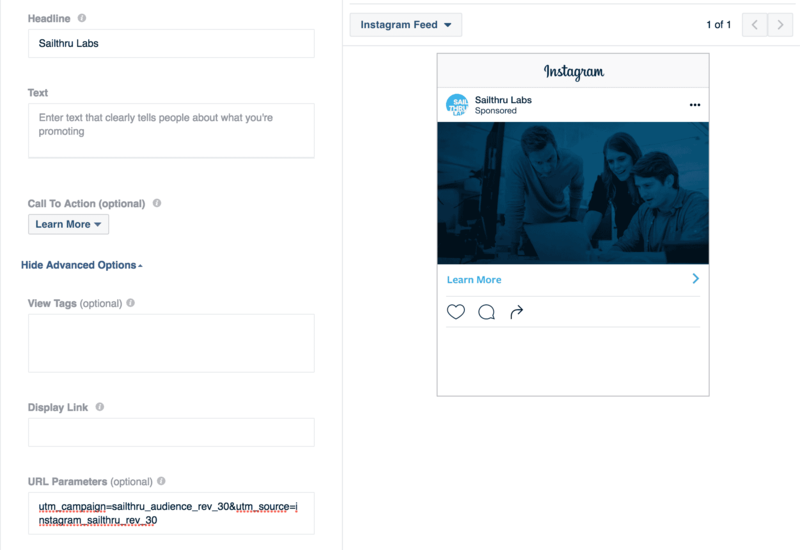 Understanding your audience on Facebook and Instagram will help you refine the audiences you create using Sailthru’s Audience builder or Prediction Manager. Prediction Manager will find all of your most valuable users, but you can also refine the Prediction Manager-based Smart List’s criteria with key data points or demographics that you want to target for the Instagram platform. Your Smart Lists-including the one you created in the previous step-and your Natural Lists all appear in My Sailthru on the Lists page. Click the cloud icon next to the list name that you want to send Facebook/Instagram. 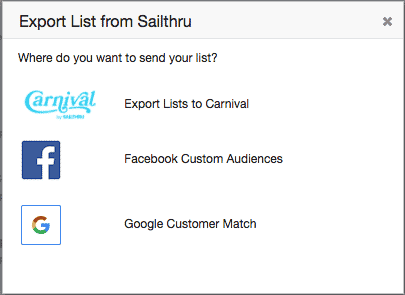 On the Export List from Sailthru window, select Facebook Custom Audiences. If this is the first time authenticating Facebook you’ll be asked to grant access to the Sailthru application. On the next screen, choose Create New Audience. When naming the audience (as it will be displayed in Facebook), choose a name that will allow you to identify it as being sourced from the Sailthru segment you used. For example “sailthru_click_7” or “sailthru_purchase_30”. This will allow you to quickly see which audiences have come from Sailthru and create lookalikes. Click Export, and Sailthru will run a job to process the list and push all users to Facebook. Depending on the size of your list this may take a few minutes. Sailthru users will be matched with users that Facebook finds across its products, including Instagram. These audiences can be targeted directly, or, more commonly, used to create a Lookalike Audiences to find users who are similar to your most valuable Sailthru users. After you have created your Facebook Custom Audience within Sailthru, continue with the steps below. Facebook allows you to use automatic placements or edit the placements to define where your ads run, but if you want to specifically target users with Instagram, choose Edit Placements when placing your Ad Campaign and select Instagram. When targeting users on Instagram it’s important to understand that the demographics of your audience may differ between Instagram and Facebook. If you’ve already been running ads on Instagram you can use those insights to help determine your optimal target demographics. If this is your first foray into targeting Instagram and Facebook users separately, we recommend testing with some smaller segments first. In early 2017, Instagram audiences tended to skew a little younger than Facebook, for example, so if you are storing age-related data in Sailthru that could be a good place to start testing. 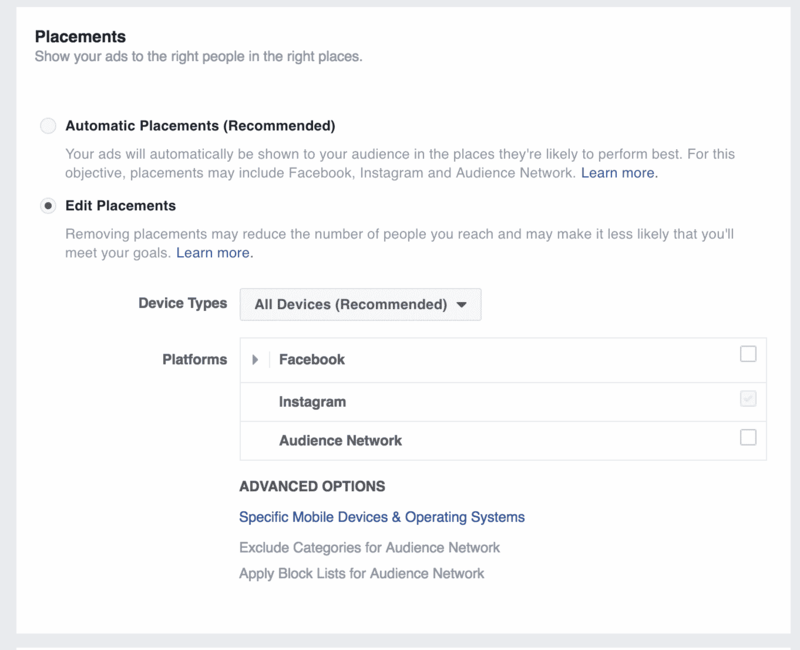 If you choose Automatic Placements, Facebook will decide where the ad units run, and, depending on the creative, will automatically place your ad across Facebook, Instagram, and the Audience Network. To uniquely track the effects of each Instagram campaign, Sailthru can use the UTM codes you add to the campaign to uniquely track users who engaged with the campaign through a unique variable matching the utm_campaign value. This value should be unique for each campaign, and will be set for each user passed to Sailthru. The example below uses the URL Parameters field to pass the UTM code for the campaign and source. Using the Sailthru audience name will allow you to track the campaign’s success.